These awards serve to recognise those local councils that have striven most to improve their green credentials for the betterment of their locality and their respective environment. Three local councils were nominated as finalists in each of the six categories. This year’s edition saw the introduction of a new award ‘Waste to Recyclables Award’ which is intended to stimulate the diversion of waste away from the mixed waste collection (black bag) and towards recycling (green bag). This first award was won by Luqa Local Council. The ‘Best Overall Performance’ which measures the performance per capita of how much recyclables are collected from the door-to-door separate waste collections and Bring In-Sites, was awarded to San Gwann Local Council with an annual collection rate of 50.5 kg / capita. Attard Local Council scooped the ‘Most Supportive Locality’ award for continuously motivating the locality to recycle more. 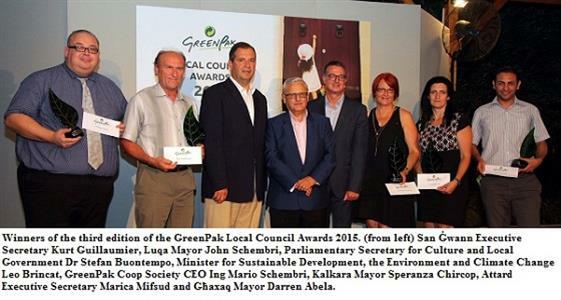 The awards of ‘Best Performance: Glass Recycling’ and ‘Most Improved Locality’ were adjudicated to be the localities of Kalkara and Ghaxaq respectively. For the second consecutive year, Inspire Foundation sponsored ‘The Inspire Foundation Award’ as a token of appreciation to those local councils participating in the used clothes collection campaign held during the past year. The award was won by Xaghra Local Council whose residents collected an average of 2kgs of used clothes per household. The award ceremony was attended by more than 80 local council mayors, executive secretaries and councillors. The Minister for Sustainable Development, the Environment and Climate Change Leo Brincat and the Parliamentary Secretary for Local Government Dr Stefan Buontempo congratulated the local councils and encouraged them to keep improving on these results in order to reach Malta’s recycling targets set out by the EU. “In this regard, we augur success to scheme operators such as GreenPak together with the Local Councils because, although it is the government who drafts policies, they cannot be obtained without their direct input and collaboration,” added the Minister. 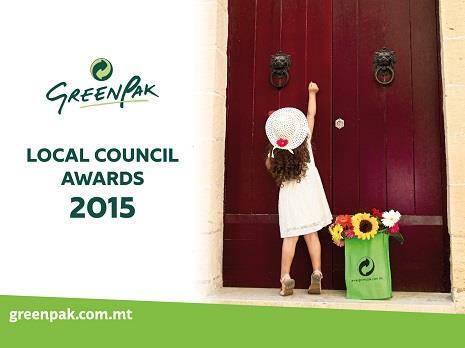 “Looking forward, GreenPak is well aware of the new challenges being faced by local councils. In view of the recent announcement of the pilot project for the separate collection of organic waste, GreenPak is well positioned to help and support its local council members. Furthermore, GreenPak will soon be introducing a separate collection for electrical & electronic goods to further sustain the current efforts being enacted to increase recycling, stimulate the circular economy and safeguard the environment,” added Ing Schembri. “As we mark our 10th anniversary, GreenPak has been instrumental in changing the mentality from one geared on taxation to one based on producer’s responsibility. The next major challenge is to convince authorities not to allow any further fiscal immorality in this sector. For transparency’s sake, it is essential to ensure a level playing field. In turn, this process will provide both peace of mind for Local Councils and residents, and smoother operations with much better results in terms of recycling,” he said. Besides receiving the trophy and certificate of achievement, the winning local councils were each awarded a cash prize of €1,000 to support ongoing environmental projects within their respective locality for the benefit of its residents.